A water filter filter, sometimes called purifier jug, typically consists of a reservoir on its upper part with a filter cartridge in it. Unfiltered water runs through this cartridge down into the jug, and become purified through the process. Small and simple in design, but water filter pitchers can be incredibly effective in removing pollutants from water. An average size jug can provide enough drinking water for a whole family. There are various other reasons why it’s such a popular item on the American countertop nowadays, but one of the main perks is that installation can be done within a minute by a 5 years old kid. Picking the best water filter pitcher, however, is not that easy. While most pitchers have the same kind of materials for their filter (activated carbon), their ability to provide sufficient safe water may vary, depending on various factors. Let’s take a look at the criteria to pick a good pitcher. Most pitchers are made of plastic, which gives them the affordability and desirable lightweightness. However, not all plastics are created the same. Low quality plastics can be a health hazard themselves, as you may be aware. Always look for BPA-free materials. It may not be completely safe, but still a good way to avoid ending up getting more toxic from the jug than you do from the unfiltered water! Installation is a piece of cake on water filter jugs. That said, not everyone take changing coconut carbon cartridges as a hobby they can spend time on every day. A good pitcher should not require you to change the filter more often than every two months. Four to six months is ideal. If you never have to change or clean anything, however, you may need to check carefully. I have yet to find a pitcher with that technology. If you’re the sole member in your household, never mind. However, if you’re a family, always check how much water the pitcher can process at one go. A larger capacity means you don’t have to repeatedly keep refilling the jug and waiting for it to work. While you will still get enough water for 3 people to drink with a 5 cup jug if you’re diligent, a 10 cup one will save you much more time and nuisance. A few minutes may not sound like a lot; however, I assure you it feels like hours if you have to stand next to the countertop waiting for it. If refilling the pitcher at all sounds like too much work for you, getting an under-sink water filter would be a better idea. Even the container of pure water needs cleaning occasionally to avoid algae, bacteria, and other unhealthy stuff from developing inside it and potentially polluting your drinking water. Therefore, it is important that your water pitcher has a simple design with little of corners, tubes, and the likes, so you can clean it easily. We spent a week looking for the best water filter pitcher based on the aforementioned criteria. Take a quick look our top picks. Filter changing indicator No indicator. Here’s our picks for the Best Water Filter Pitchers. Looking for a moderate sized water filter jug to keep your family hydrated? Check out this 8 cup Aquagear pitcher. I have to say upfront that this jug belongs to the more expensive spectrum of water pitchers. At approximately $70 dollars, what does it have to offer? First, it has a nice design. Not fancy, but highly efficient and functions oriented. The materials are FDA approved food grade plastic and are BPA free. If you care about living green, this pitcher is a good choice because it’s 100% recyclable, and also it saves the earth from more plastic bottles. The manufacturer also says it’s vegan if that’s important to you. Personally the idea of “vegan plastic” doesn’t really ring a bell to me. Second, the replacement filter is made in the USA, and has excellent quality. It has been certified by various trusted labs in the US to remove over 89 contaminants. It reduces a significant amount of fluoride (90.06%), lead (99.9%), mercury (97.8%), arsenic (99.8%), copper (99.7%), to name a few. The filter also cuts off 99.9 percent of chlorine from your tap water, leaving it with a very pleasant taste and odor. Not only effective, but the filter is also strong in capacity. It can filter 150 gallons of water before you need to replace it. That translates to a lifetime of about 7 months for each filter! If you’re living alone, or are a mini family of 2, it’s best to have a small pitcher that gives you enough quality water without taking up too much counter space or fridge space. The Brita Slim is the best small filter pitcher you can find in this regard. The Brita Slim is…slim. It is designed in a way that allows it to fit easily in the side door of your fridge with no problem. With a capacity of 5 cups and an all-BPA-free-plastic shell, it’s extremely lightweight. You can hold it with one hand even when it’s full. This is also one of the few filter jugs that a kid can easily handle. The jug has a simple lid that opens all the way when you need to refill it, and an ergonomic handle for easy holding. There is no gimmick details on its body. This makes it very easy to clean, which you should do every week or two. In fact, it even misses one of the important feature: the indicator that tells you when to change the filter. Unless you’re extremely forgetful (like me), it should not be a problem. Just make a note or a reminder in your phone to change it every 2 months or so. If you’re lazy, the Longlast replacement filter also fits with this pitcher. It can filter 120 gallons of water before it needs changing, which is about 6 months of use. Most families who have ever tried using a water filter pitcher have had a Brita. The Brita Everyday is almost a must-have, especially among smaller households of 2 – 4 people. The pitcher comes in a simple and admittedly boring appearance. It has a plastic shell (Don’t worry, it’s BPA free), with a white upper reservoir and handle, and crystal clear container. The jug has a lid that can open completely, making refilling water a bliss. The whole body is a smooth, plain design, which is actually an advantage as it’s easy to clean. The Brita everyday comes with a filter core that can filter about 40 gallons of water. It is certified to filter out and reduce the amount of toxins such as chlorine, copper, mercury and cadmium, significantly improving the taste and the odor of tap water. Unfortunately, it doesn’t have an indicator to tell you when to change the filter. If you can’t really keep track of the amount, which most people can’t, just remember to replace it every 2 months. There’s a sticker on the lid where you can mark the month you need to do that, so it’s actually not that much of a headache. Or you can use the WQA certified Longlast replacement filter, which is effective for 3 times longer than the standard filter. It fits in the Brita Everyday perfectly, and you won’t have to worry about replacing the filter more than 2 times a year. Tip: Wait until all of the water is filtered before you use it. If you try to pour the water out when the upper part is still more than half full, the contaminated water may pass through the lid and mix with the filtered water. 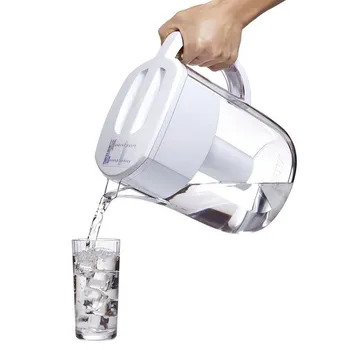 To provide enough fresh, purified water or a small family of three or four people, the 15-cup Restore Alkaline Pitcher is among if not the best pitcher on the market. The pitcher comes in a BPA free clear plastic shell. Unlike other pitchers, the reservoir is also clear, allowing you to see how much water you have filled it with. Another innovative feature of this jug that many Brita’s are missing is the smart lid. In the center of the lid is a small hole covered by a flexible flap. When you pour water in, the pressure will push the flap open. You don’t have to keep the lid open with your hand. The filter (PH001) is probably one of the most effective out there. It has a duo micronet system, combined with US made activated coconut carbon charcoal and KDF to remove not only visible particles but also various heavy metals such as lead, copper, arsenic, and mercury. Combined with the PH002 membrane filter (sold separately), it filters 99.9% of all organic and inorganic matter out of the water. While results may vary depending on the quality of the water you feed it with, many customers have reported that they find remarkable improvements in the taste and the smell of the water after running through the pitcher. It also has an impressive life: it can purify 1500 cups or 96 gallons of water before you need to change it. And you don’t even have to keep track of the amount by yourself. The lid has an electronic indicator on it that tells you how many times it can still work before a replacement is needed. Tip: Don’t fill the reservoir all the way. It’s best to fill it until the water reaches the upper part of the handle, or else the water will start dripping out. For a family of four or more people, the 18 cup Pur Water Dispenser is a very good option. The dispenser has a BPA free clear container with a beautiful deep blue reservoir. It’s not exactly tiny, with a capacity of 18 cups or more than 1 gallon, but the slim design allows it to sit in your fridge with little problem. As a dispenser, the Pur doesn’t have a handle or a spout like the pitchers (which wouldn’t have any practical use anyway). Instead, it has a tap near the bottom so you can get the filtered water. The filter that comes with it is made from heat treated coconut shell carbon. This kind of material, with its numerous tiny pores, is very effective in taking up contaminants and heavy metals. While it doesn’t remove 100% of the fluoride and chlorine, it does do wonders to the smell and the taste of your water. You will surely enjoy your water a lot more! Once the original filter is used up, which is about 2 – 3 months, you will have to replace it. This dispenser doesn’t have a filter life indicator. However, it does have a sticker on it so you can mark the day to change the filter. Most complaints on this water dispenser is not about the water quality, but rather about the container itself. Some tend to leak within a week after you start using it. Tip: It’s rare to come across defects on this PUR dispenser. However, if you buy one and notice any mild leaking, return or replace it immediately while you still can, as the leaking tends to get worse over time. Having any question about water filter pitchers? Drop it at the comment section – we’ll get back to you ASAP. Did not find the pitcher you were looking for? Discover more household water filters for specific uses. Luna I just get Pur 18 after reading your post. Great job! I have a water softener will that affect the filter life?